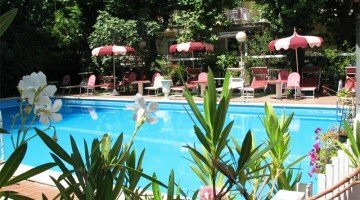 The Hotel Fabius , 3 star hotel in Rivazzurra di Rimini, has a swimming pool with diving board and solarium, parking, free WI-FI and rooms with air conditioning and balcony. Offers children free entry to the Beach Village water park. Accept small animals. It is located near the beach of Rivazzurra di Rimini, a quiet village south of Rimini. The theme park of Fiabilandia can be reached by walking for 15 minutes, while the center of Rimini, as well as Riccione, can be easily reached by bus line No. 11. The rooms have been recently renovated, have a balcony, free WI-FI, LED TV 22 ", safe, direct dial telephone, hairdryer and private bathroom with shower, available on request: rooms with sea view, air conditioning, minibar. FAMILIES : multi-bed rooms and communicating solutions are available. Garden, swimming pool with diving board and equipped solarium area, free use of bicycles, lift, reading room, 24 hour reception and newspapers available. The hotel organizes themed nights with live music. We organize excursions. PARKING : uncovered and free, inside and outside the structure (300 meters). AIR CONDITIONING: in the whole structure, in the room free only with All Inclusive formula. CONVENTIONS : beach, amusement parks of the Riviera, spas of Rimini, law enforcement, organized excursions. Offers admission (children) and free transportation to the Beach Village water park. BREAKFAST : sweet and savory served buffet style, with different dishes including homemade desserts. LUNCH AND DINNER : guests have at their disposal multi-choice menus with traditional recipes from Romagna, homemade pasta and a rich buffet of appetizers and vegetables. In hotel : outdoor playground area, bottle warmer, afternoon snack, pediatrician service on request. At meals : baby menu and high chairs at the table. On the beach : live entertainment and baby park. In the garden guests will find a large pool of 150 square meters in a sunny location with a trampoline, a jet of bubbles and a rescue service. The pool is surrounded by a sunbathing area with sun loungers and free WI-FI connection. 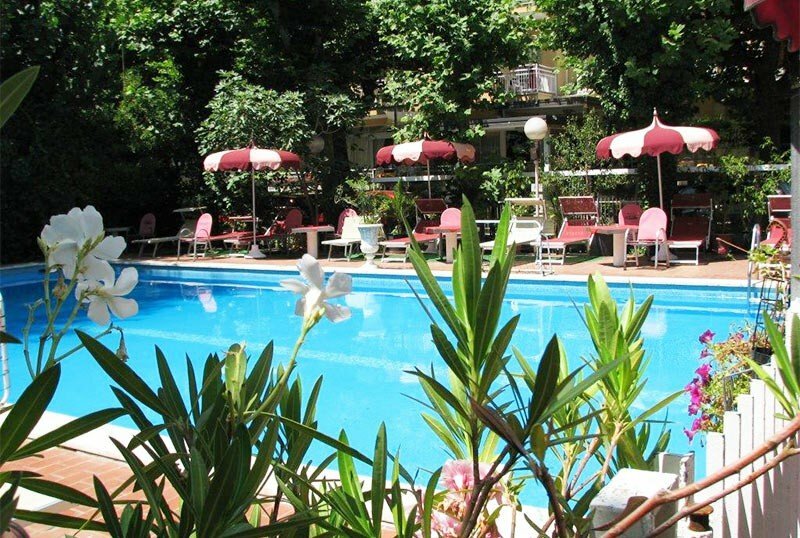 The hotel has an agreement with the Bagno Silvano beach n. 123 equipped with mini club and live entertainment, nursery, baby park with inflatables, sports fields, relaxation area, table tennis and bocce court. Book our Easter offer with Parks of Mirabilandia, Fiabilandia and Oltremare FREE.